Add some upscale fun to your Christmas décor with this 52in White Angel decoration. 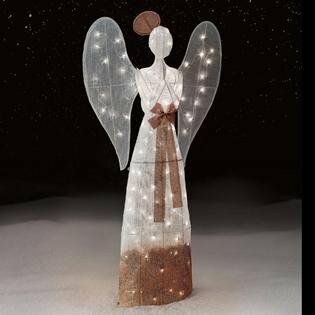 The angel is made from a 3D durable, pre-wired metal frame that is easy to assemble, and take down for storage at the end of the season. Whether placed outside on the lawn or inside beside the Christmas tree, this decor is a fun and pretty way to celebrate the holidays that will delight you and your family for many years to come. If you have any questions about this product by JS, contact us by completing and submitting the form below. If you are looking for a specif part number, please include it with your message.